was a bit of a fun when it was first played in England in 2003 but not any longer. Now that it is the game's main money-spinner, the whole perception has changed and players have to adapt to its different concept and different skills are required. perfected by the players. It is doubtful that the M.C.C Coaching manual would have its own section, for example, the Dilscoop! All aspects of batting, bowling, fielding and wicketkeeping are very well covered in each section and the depth which the authors go to is very praiseworthy. 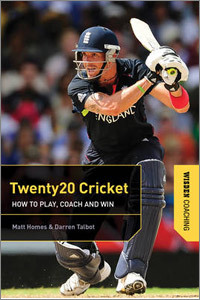 How to play an array of shots, running between the wickets, how to bowl any number of different balls, the various fielding techniques make this an indispensable guide for any aspiring cricketer. With fitness now vital in this most frenetic of games, the last chapter is devoted to this most important aspect and a wide range of tests and drills are recommended to complete this excellent tutorial guide. Matt Homes and Darren Talbot are to be congratulated on this very well presented and easy to follow guide.